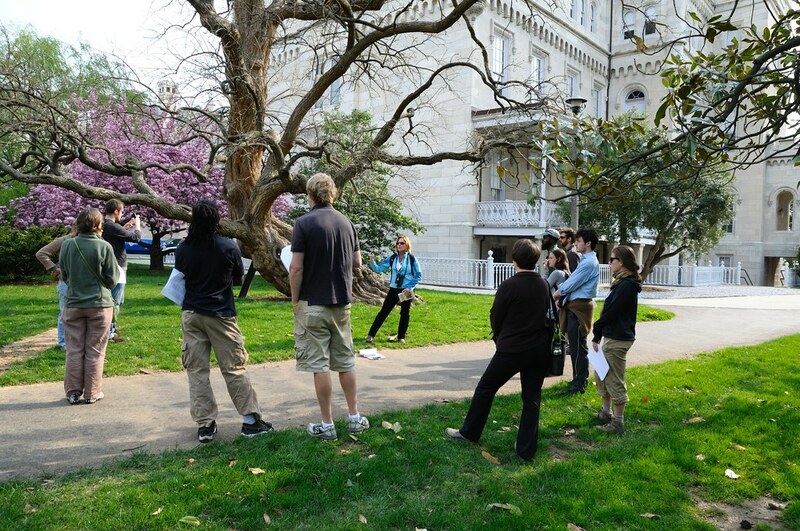 A tree tour at Lincoln Cottage this past spring. Fort Dupont Fall Tree ID Walk: Celebrate bright fall foliage with this educational tree tour of Fort Dupont Park. Shawn Walker, Urban Forestry Instructor for Casey Trees, and Jorge Bogantes Montero from the Anacostia Watershed Society will lead the tour. Explore Fort Dupont's diverse tree canopy and hone your tree identification skills. Check out our post on Fort Dupont for more reasons to sign up for this tour. Saturday, Oct. 15: 10:30 a.m. - 12:30 p.m.
Bike Tour on the National Mall: Melanie Choukas-Bradley, author of City of Trees, will lead a leisurely bike tour of notable trees along the National Mall. Enjoy the scenery and trees of the National Gallery of Art, Smithsonian Institution Museums, U.S. Department of Agriculture, U.S. Capitol grounds and the United States Botanic Garden. Hurry - there are only 5 spots left in this popular tree tour! Sunday, Oct. 23: 9 a.m. - 12 p.m.
Evergreens, Winter ID and Bird Habit: New to our tour schedule, "Evergreens, Winter ID and Bird Habit" will explore winter tree life at the U.S. National Arboretum. Learn about evergreens and the important role trees play in providing winter homes for birds. Our own Mike Ferguson and Shawn Walker will lead the tour. Saturday, Dec. 3: 10 a.m. - 12 p.m.
Can't make it out to a docent-led tour? Our downloadable tree walks are the perfect way to explore the District's noteworthy tree spots on your own time and at your own pace. Featured currently are guides to the Franciscan Monastery of the Holy Land, NGA Sculpture Garden and Tudor Place. Check back frequently for new downloadable tree walks.